The story of Edward Snowden and how he got to be in a position where he could leak details of the National Security Administration’s (NSA) surveillance program is revealing a great deal about the privatization of our national security system. Much of what we are seeing is not pretty. The critical question is, "How did so many private contractors wind up in the national security apparatus?" However, apart from the extensive system of surveillance at the NSA, Snowden has also called attention to the extent to which national security operations have been privatized. Of course, Snowden did not work directly for the government; he worked for Booz Allen Hamilton, a private contractor. Booz Allen is a $6 billion a year business. It gets the vast majority of its revenue from government contracts like the one that paid Snowden’s salary. While the specifics of Snowden’s work are not clear, we know that he was being paid more than $120,000 a year. That’s pretty good pay for someone who just turned 30 and never graduated high school. Needless to say, Booz Allen was billing the taxpayers even more for Snowden’s work since they are in business to make a profit. Snowden may have had extraordinary skills that would justify this sort of pay, but there is no way for the public to know. It turns out that even the background check that provided the basis for Snowden’s security clearance was done by a private contractor. USIS, a company based in northern Virginia, did the background check on Snowden and many other people with security clearance. The descriptions within The Prince have the general theme of accepting that the aims of princes—such as glory and survival—can justify the use of immoral means to achieve those ends. I say, therefore, that the arms with which a prince defends his state are either his own, or they are mercenaries, auxiliaries, or mixed. Mercenaries and auxiliaries are useless and dangerous; and if one holds his state based on these arms, he will stand neither firm nor safe; for they are disunited, ambitious and without discipline, unfaithful, valiant before friends, cowardly before enemies; they have neither the fear of God nor fidelity to men, and destruction is deferred only so long as the attack is; for in peace one is robbed by them, and in war by the enemy. The fact is, they have no other attraction or reason for keeping the field than a trifle of stipend, which is not sufficient to make them willing to die for you. They are ready enough to be your soldiers whilst you do not make war, but if war comes they take themselves off or run from the foe; which I should have little trouble to prove, for the ruin of Italy has been caused by nothing else than by resting all her hopes for many years on mercenaries, and although they formerly made some display and appeared valiant amongst themselves, yet when the foreigners came they showed what they were. Thus it was that Charles, King of France, was allowed to seize Italy with chalk in hand; 1 and he who told us that our sins were the cause of it told the truth, but they were not the sins he imagined, but those which I have related. And as they were the sins of princes, it is the princes who have also suffered the penalty. In other words, the citizens of a democracy have obligations. Unless they are willing to bear the costs, they will bear the consequences of the use of a mercenary force, as Machiavelli predicted about 500 years ago. We have to bear in mind that, for certain functions, government does some things better than the private sector. 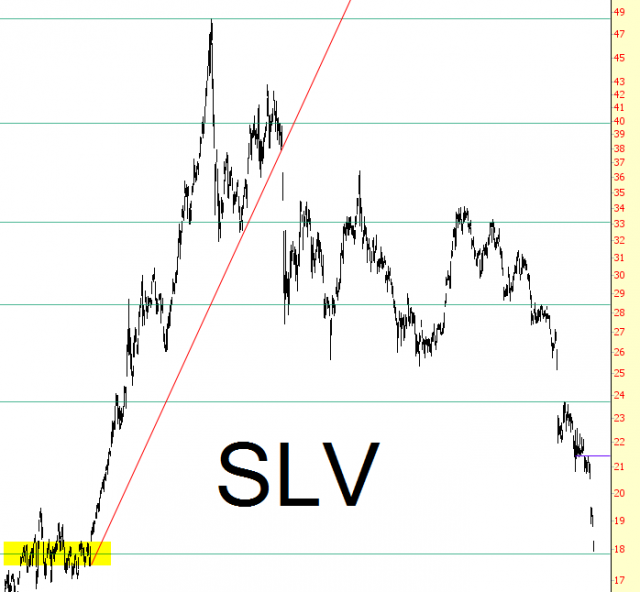 This precious metal recently dropped through one important uptrend (dotted line). There is, however, one ultimate last line of defense for the gold bulls, which represents the uptrend stretching back to 2001 (solid line). Uptrend support appears to be at roughly $1150. Here is a short-term chart of GLD and TIP. TIP rallied today, though GLD sold off. This represents a short-term divergence, though minor, that cannot go on forever. In short, precious metals appear to be setting up for a relief rally at these levels. However, keep an eye on the longer term trend to judge whether the gold bulls' last stand is successful or not. Wow! No sooner than I had published my post Watch these lines in the sand, all four of my tripwires were triggered on Thursday. At that point, I got a number of questions from readers with questions amounting to "what do I do now?" (For the answer, please see my post Why this isn't investment advice). Let's survey the technical damage that was done on Thursday and carried through to Friday. 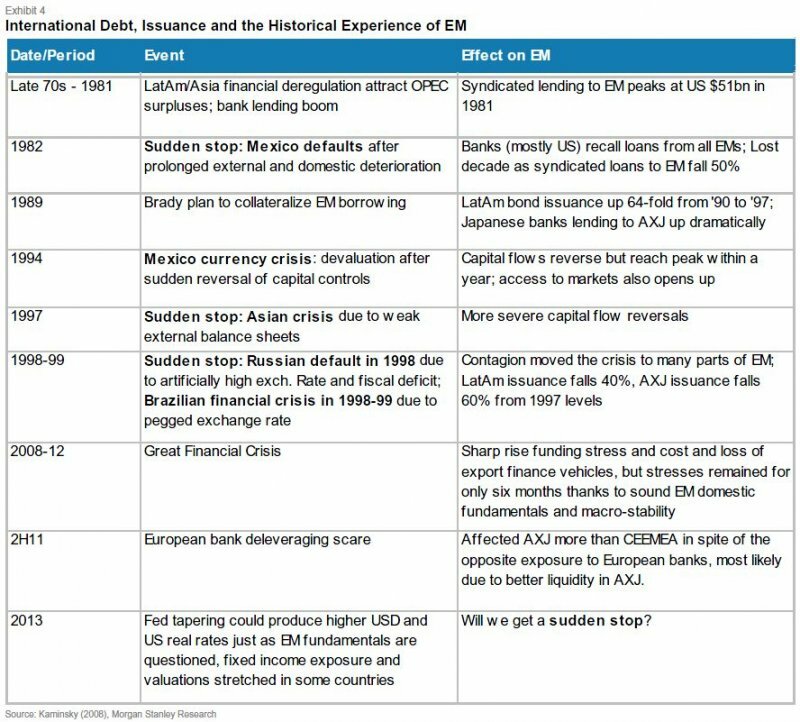 First and foremost, emerging market bonds continued to crater. Never mind the spread between EM bonds and Treasuries, look at the relative performance of EM bonds against US high yield, which broke an important relative support line. The line in the sand for the 10-year Treasury yield was 2.4%, which was breached Thursday and decisively on Friday. During this current stock market advance, European equities had halted bouts of weakness at the 200-day moving average. That support level was also broken. On this side of the Atlantic, the 50-day moving average provided support for the SPX. The index went through the 50 dma convincing this week. However, my analysis of market internals indicate that the current weakness is likely to be just a minor correction. The most obvious support level from which this pullback ends is roughly the 1510 level, which represents the 200 dma and the uptrend line that stretches back to October 2011. China’s benchmark money-market rates retreated from records after the central bank was said to have made funds available to lenders amid a cash squeeze. The one-day repurchase rate dropped 384 basis points, or 3.84 percentage points, to 7.90 percent as of 9:33 a.m. in Shanghai, according to a weighted average compiled by the National Interbank Funding Center. That is the biggest drop since 2007. The seven-day rate fell 351 basis points to 8.11 percent. They touched record highs yesterday of 13.91 percent and 12.45 percent, respectively. I was highly concerned about tail risk because of the tight liquidity conditions in China, as it had the makings of a credit crunch. 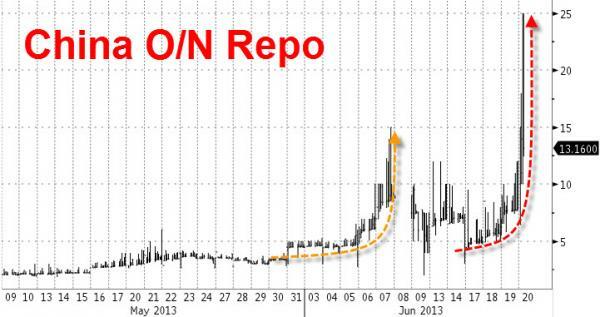 The PBoC was at risk of making a policy mistake, which could have evolved into a Lehman moment (as Zero Hedge is fond of pointing out). The act of liquidity injection alleviated many of those concerns. Based on his [finance academic Nejat Seyhun] analysis of how the stock market has tended to perform in the past whenever insiders were behaving like they are today, his best estimate is that the Wilshire 5000 index will rise 6.7% over the coming 12 months. Though that is lower than the stock market’s historical average return of around 10%, it would be a far better outcome than the decline that many on Wall Street worry will be the result of the Fed dialing back its stimulus program. Past research has shown that insider buying is far more significant a signal than insider selling. Insiders may sell for all kinds of reasons. On the other hand, if an insider puts up his own hard earned cash to buy the shares of his own company, it's a far more significant indicator. In addition, market internals are not highly atypical of a severe downturn in the economy or rising systemic risk. For instance, I was concerned about the contagion risk posed by the EM sell-off. 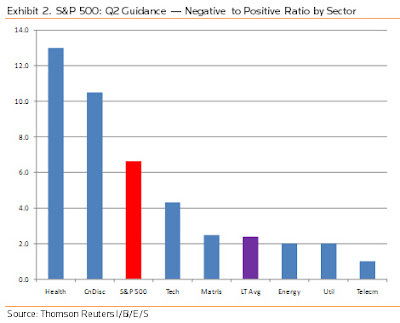 If market believes that contagion risk is rising, it should show up in the relative performance of financials. Consider the chart below of US financials against the market, which remains in a relative uptrend. In effect, Mr. Market is saying, "What financial contagion risk?" Look at the relative performance of the Broker Dealers against the market. Broker Dealers represent the "high beta" portion of the financial sector. Not only is this group not selling off, it appears to have formed an head and shoulders pattern on a relative basis, which suggests further outperformance to come. Take a look at the financials in Europe. 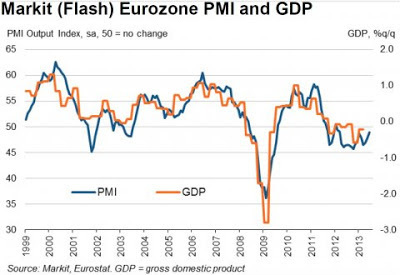 While its near-term relative weakness may be reflective of anxieties over Greece, European financials remain range-bound against the broader market and Mr. Market is showing little sign of anxiety in this sector. In the US, the economically sensitive sectors continue to perform well and display no signs of any severe concerns about an economic slowdown. The Morgan Stanley Cyclical Index remains in a long and well defined relative uptrend against the market. Similarly, the Consumer Discretionary stocks are remain a relative uptrend. These factors combine to paint a picture that the bears have a lot of work to do before taking control of the tape on an intermediate term basis. Unless the picture deteriorates, the current combination of insider buying and sector internals suggests to me that the stock market is due for a period of pullback and consolidation, but the outlook is no disaster. However, stocks are not out of the woods in the near term. 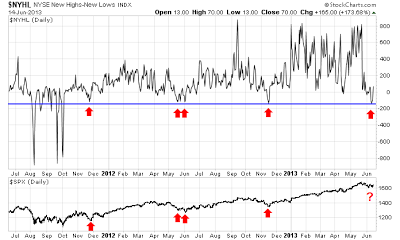 To put it simply, the market is oversold, but it's not severely oversold. 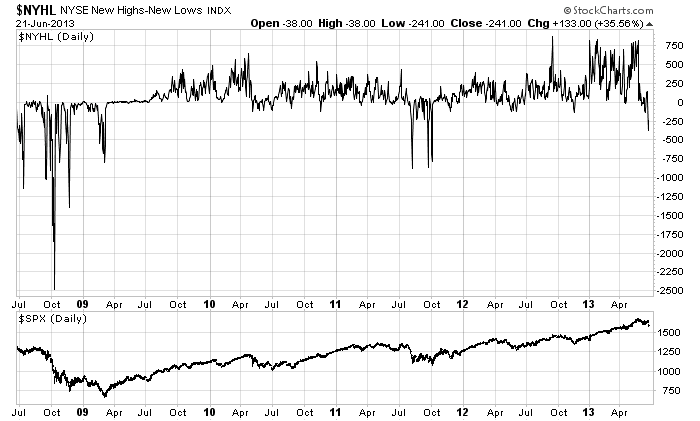 The chart below shows the NYSE New highs - New Lows on the top panel and the SPX on the bottom panel. The NH-NL indicator is in oversold territory, but it hasn't reached the kinds of severe oversold readings that are consistent with the end of corrections. 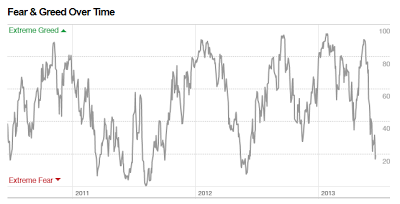 CNN Money maintains a fear-greed index based on the combination of junk bond demand, market momentum, safe haven demand, put and call options, stock price strength and stock price breadth. 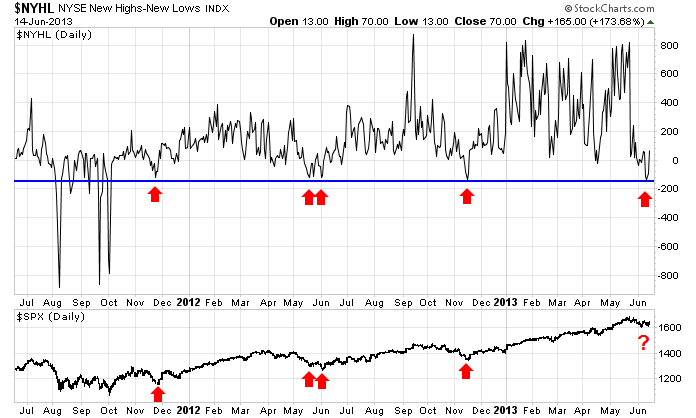 As the chart below shows, readings are in fear territory, but they are not quite at severe extremes yet. To summarize, the PBoC's liquidity injection late last week signaled that tail risk in China has been drastically reduced. 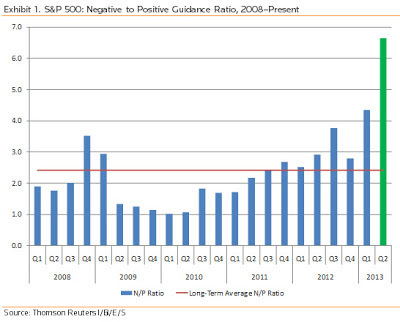 Nevertheless, we have seen considerable technical damage done to the equity bull. Markets remain jittery and every headline that comes across the tape about the timing of the Fed's QE taper will result in a risk-on or risk-off reaction. However, insider activity and sector internals do not suggest that the global economy is turning down, which is bullish. Unless Street earnings expectations were to get revised down dramatically or the Chinese banking system liquidity flare up again, my base case is that the stock markets undergo a period of correction and consolidation. For the US averages, the likely floor under such a scenario is 1510 on the SPX. Has anyone else had the same experience? 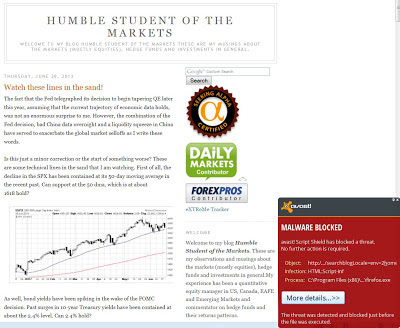 If so, please contact me at cam at hbhinvestments dot com.and please include the platform (operating system, browser and virus software) that you are using. 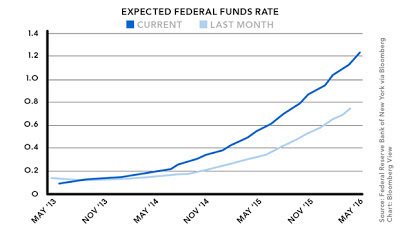 The fact that the Fed telegraphed its decision to begin tapering QE later this year, assuming that the current trajectory of economic data holds, was not an enormous surprise to me. However, the combination of the Fed decision, bad China data overnight and a liquidity squeeze in China have served to exacerbate the global market selloffs as I write these words. Is this just a minor correction or the start of something worse? These are some technical lines in the sand that I am watching. First of all, the decline in the SPX has been contained at its 50-day moving average in the recent past. Can support at the 50 dma, which is at about 1618 hold? As well, bond yields have been spiking in the wake of the FOMC decision. Past surges in 10-year Treasury yields have been contained at about the 2.4% level. Can 2.4% hold? I wrote that past declines in European equities have been contained at its 200 day moving average (see The bear case for equities). Can the 200 dma hold? 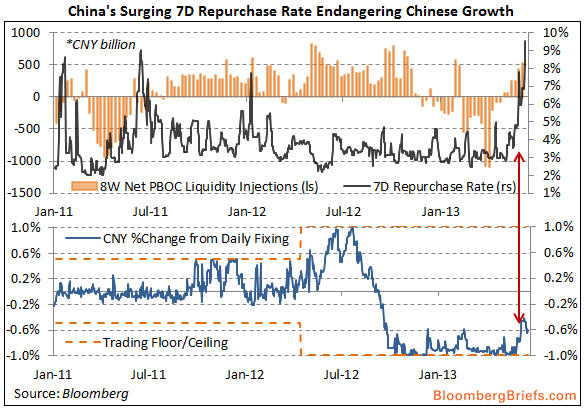 In China, the combination of poor June flash PMI and a liquidity crunch have served to throw the markets into a tizzy. 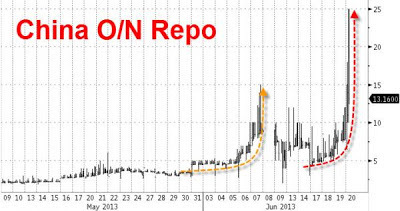 Zero Hedge reports that overnight repo rates spiked to 25%, which is evocative of the market seizures seen during the Lehman Crisis. China's government has stepped up efforts to lift confidence in the country's flagging stock markets by buying more shares in the four biggest commercial banks, stock exchange statements showed on Monday. Central Huijin Investment Co, which holds Beijing's investments in state-owned financial firms, spent about 363 million yuan ($59.2 million) buying bank shares on June 13, Reuters calculations based on stock exchange filings showed. This is the third time Huijin has been known to be buying shares in the secondary market since June 13, when China's stock market skidded to six-month lows after data showed the world's second-biggest economy was cooling faster than expected. Can the 50 dma hold for the SPX? Can the 10-year Treasury yield breach the 2.4% level? Can decline in the STOXX 600 be arrested at the 200 dma? 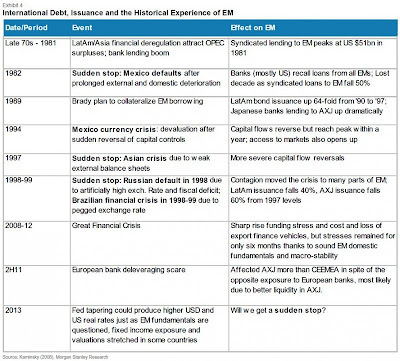 Will emerging market bonds melt down? Some $30 trillion in assets is expected to be shifted to younger generations over the next 30 years, according to Pershing LLC, a subsidiary of Bank of New York Mellon. And advisers typically lose half of the assets they manage when those assets are passed from one generation to the next, a 2011 study by consulting firm PriceWaterhouse Coopers found. In a survey of 317 advisers conducted in February and March, Pershing found that more than half of their affluent clients had adult children, but advisers had talked about finances with only about a third of those children. Advisers who don't want to lose those assets should get up to speed on how to win the next generation. The basics: Attract them with engaging events and modern practice-management methods, then retain them with solid financial planning. You can start by coordinating a family meeting so your clients can introduce you to their children. Make estate planning the focus so you can explore the family's expectations for their wealth - and try to ferret out situations where the parents and the children might have different financial objectives that could complicate your serving both of them at the same time. Offer to provide complimentary financial planning to your clients' children. These accounts won't pay big, but the parents will appreciate it. Then hand off those accounts to younger advisers in your office. Not only will this be good practice for them, they'll probably be better at relating to the younger clients. Consider making over your office to make it more appealing to the next generation, said Wayne Badorf of Wells Fargo Asset Management, a practice-management expert. Put a few magazine-loaded iPads in the lobby, install Wifi and add energy drinks to your complimentary beverages. You may need to revamp your online image. As long as your compliance officer approves, use your site to link to financial podcasts and interesting websites. And make it a portal for clients to access their statements and make updates to accounts. I believe that such approaches are likely to yield disappointing results. When I speak to affluent Baby Boomers, their fears are that their children will not have the tools to properly manage their wealth. Their darkest fear is their kids acquire the Paris Hilton syndrome. A common refrain is, "What happens when my twentysomething son/daughter gets this [six or seven figure] windfall drop in their laps?" Studies reviewed by the Library of Congress indicate that U.S. retail investors lack basic financial literacy. The studies demonstrate that investors have a weak grasp of elementary financial concepts and lack critical knowledge of ways to avoid investment fraud. There is a silver lining in this dark cloud. The FINRA study showed that higher income groups were more financially literate than the general population. Nevertheless, I believe that the road to recruiting the next generation of clients is involves a dual-track approach of financial education and instilling a passion for creating wealth. The latter is important because it shifts the attitude of the next generation from viewing the inheritance as consumption (the Paris Hilton symdrome) to wealth generation. They call it “money camp.” Twice a week, 6- to 11-year-old scions of wealthy families take classes on being rich. They compete to corner commodities markets in Pit, the raucous Parker Brothers card game, and take part in a workshop called “business in a box,” examining products that aren’t obvious gold mines, such as the packaging on Apple Inc.’s iPhone rather than the phone itself. Lintz, 58, is on to something. Her 22-year-old firm was No. 2 among the fastest-growing multifamily offices in the second annual Bloomberg Markets ranking of companies that manage affairs for dynastic clans, Bloomberg Markets magazine reports in its September issue. The assets that FMP supervises grew 30 percent to $2.6 billion as of Dec. 31, just behind Signature, a Norfolk, Virginia-based family office that expanded 36 percent in 2011 to $3.6 billion. I believe that Lintz has found a formula that many financial advisory firms catering to the HNW market has ignored or didn't know how to approach - the issue of how to recruit the next generation of clients. By combining financial literacy education and an approach that instills a passion for creating wealth, her firm has made its AUM much stickier and fashioned an important tool to recruit older clients who are concerned about these issues of how to pass the family torch. Investment firms, analysts and advisors spend a lot of time talking and thinking about how companies create value. This is one way of how investment firms can create values for themselves. 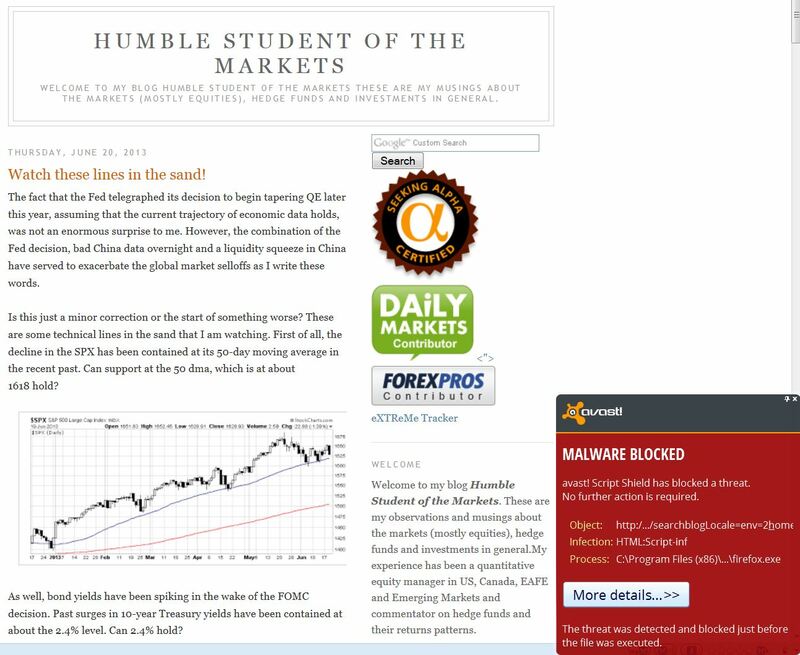 I wrote last week that I was closely watching the behavior of emerging market bonds to see if we are experiencing just a minor market correction or if this is the start of something worse (see The bear case for equities). EM bonds had stabilized late last week and my inner bull breathed a sigh of relief. Then today(Tuesday), which was a risk-on day for global equity markets, EM bonds took a nasty tumble and set off alarm bells again. Consider this chart of the relative performance of EMB (emerging market bonds ETF) against HYG (US high yield ETF). EMB successfully tested a key relative support level and rallied. Just as I started to get constructive on the risk-on trade, EMB reversed itself and went south again. What was unsettling was that this EM selloff occurred on a global equity risk-on day when the Dow Jones Industrials was up over 100 points. 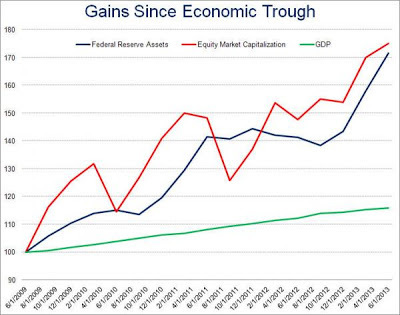 While the selloff is not terribly surprising as we saw hot money rush into EM as the Fed and other global central banks engaged in repeated rounds of quantitative easing. Most recently, SocGen analyst Kit Juckes wrote that we are seeing the down slope of an emerging markets bubble. David Keohane of FT Alphaville has an excellent discussion of the Chinese credit conditions and an assessment of the risks here. 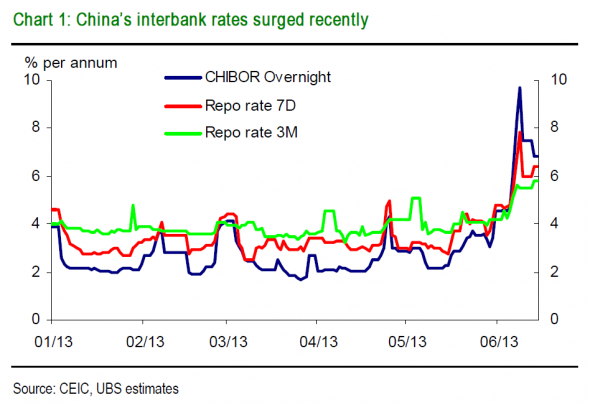 Walter Kurtz of Sober Look also pointed out that the SHIBOR curve is highly inverted and inverted yield curves are indications of tightening credit conditions and can be precursors to economic slowdowns and recessions. At this point, the EMB/HYG ratio has not convincingly fallen through relative support. I regard this as a yellow flag and not a red flag. Nevertheless, these readings are indicative of how jittery the markets are. 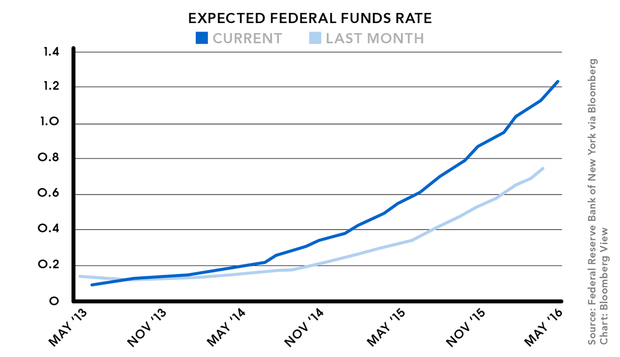 All eyes are on the Fed. If the FOMC statement is not satisfactory to the markets and the markets sell off, it wouldn't take much to turn the yellow flag into a red flag. 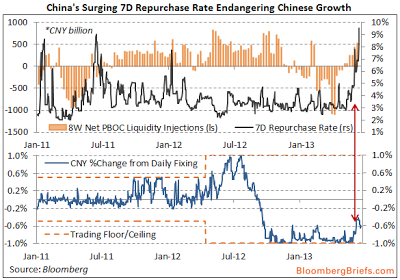 The whispers of Fed "tapering", which caused an unwind of the risk trade in EM bond and equities. By the end of the week, it appeared that the storm that was battering the markets was abating. 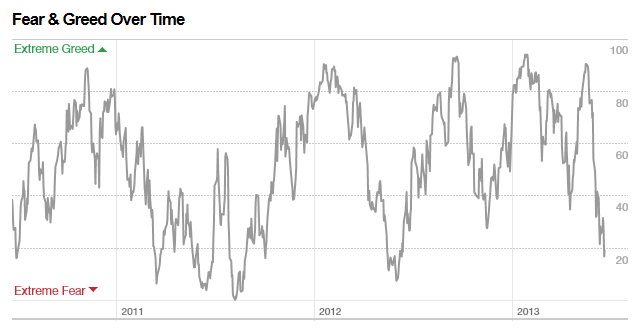 Breadth indicators had reached oversold levels and fear levels were starting to recede. Consider this chart of the NYSE New highs - New lows, which fell to levels consistent with the end of past minor corrections and saw a bounce late in the week. Bill Luby at VIX and More suggested watching DBV, the currency carry trade ETF, as a measure of risk appetite. Look at the five year weekly chart, DBV fell to the bottom of its Bollinger Band, which is an indication of an oversold condition, and mean reverted late in the week. Such mean reversion rallies from oversold are classic buy signals. The question then becomes one of whether this is just a minor correction of the start of a bigger bearish impulse in stock prices. As I mentioned earlier, the fear of Fed tapering threw a scare into emerging markets, largely because the QE promise of cheap money pushed a lot of "hot money" into EM and the prospect of an unwinding caused the "hot money" to rush for the exits. The carnage is particularly acute in emerging market equities. The chart below shows the relative performance of emerging market stocks (EEM) to the MSCI All-Country World Index (ACWI). This longer term chart back to 2008 looks rather ugly. EM equities staged a relative rally in the wake of the Lehman Crisis but topped out in 2010 and they have been underperforming global equities ever since. Earlier this year, EEM broken an important relative support level against ACWI and has been plunging ever since. From a technical viewpoint, there is no bottom in sight. Which is giving us a better signal? EM bonds or equities? On the other hand, nagging doubts remain as the sources of volatility are still intact. First and foremost, the prospects of Fed tapering has heightened market volatility? 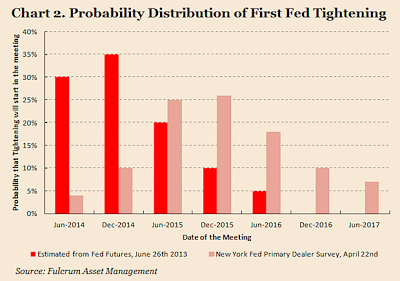 Tim Duy believes that the September FOMC meeting is the most likely point at which the Fed announces that it would start to pull back on QE and his view is becoming the consensus one. He pointed to the likely trajectory of the unemployment rate as one of the key triggers of when the Fed would start to pull back. 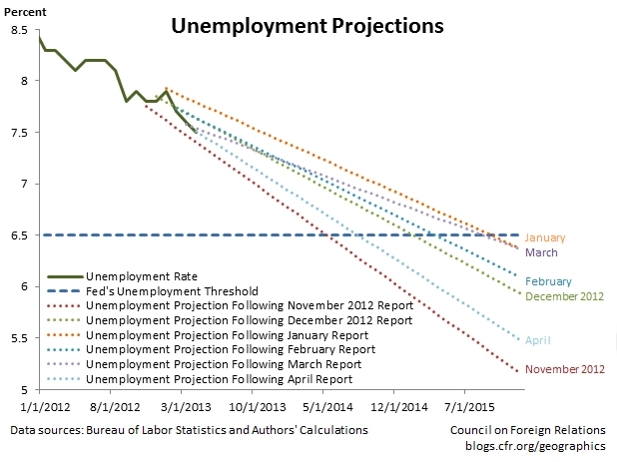 On the other hand, Benn Steil and Dinah Walker indicated how difficult it is for the Fed to project unemployment rates by showing how the forecasts have changed over time and the likely effects on the timing of a change in policy. A drawn-out debt ceiling fight in Congress could undermine the jobs growth that is expected later this year. Economists argue that the nation's economic expansion is poised to accelerate in the fall once it weathers the headwinds of tax hikes and spending cuts. While I recognize that any Fed action is highly "data dependent", would the FOMC move in the face of such fiscal uncertainties? On the whole, the entire commodity complex remains weak and the downtrend in prices remain intact. "The main risk related to China remains the possibility that high investment rates prove unsustainable, provoking a disorderly unwinding and sharp economic slowdown," it warned. It further added that "should investments prove unprofitable, the servicing of existing loans could become problematic - potentially sparking a sharp uptick in non-performing loans that could require state intervention". "Most shocks that have created sudden stops in the last 30 years have not been big enough to engulf all of EM, nor did they affect systematically important countries first," write the analysts. "Rather, it was the combination of a shock to a vulnerable economy and contagion that spread the shock to other economies sharing a common characteristic with the economy at the epicenter of the shock." Most of the negative guidance has been concentrated in the Healthcard, Consumer Discretionary and Technology sectors. We can interpret these readings in one of two ways. The most obvious is, "Wow! Earnings are going to be ugly and stocks are going to get hammered." The more nuanced take is that companies are guiding down expectations so that they can beat Street estimates, so most of the bad news is out already. I have no idea which is the correct way of interpreting the deluge of negative guidance. Add in the uncertainty of the effects of sequestration, the wobbles last week in consumer confidence offset by the positive surprise in retail sales, you have the ingredients for more uncertainty and volatility. Is the correction over? I honestly don't know. Last Monday, my Trend Model moved from a "risk-on" reading to "neutral", but my level of confidence in its forecast has fallen because macro uncertainty has risen substantially. We are at a crossroads in terms of market direction. My best forecast is that volatility is likely to continue.